6.3.2013. Nothing tops off a dinner at a trucker-style salad bar like a visit to the local cattle herd and mooing loudly along with them. These guys were a little startled by us. They didn't quite get it that we were all victims of Big Food. Well, back in the room to ruminate. We started off the day completing our tour of the Loess Hills Scenic Byway, finally cutting over to Sioux City, then across the Missouri into southeastern South Dakota. Here we followed a route through Yankton referred to as the Lewis & Clark trail. It bears some relationship to the wide Missouri River along here, but who knows if it actually bears any relation to Lewis and Clark. To us it was merely brilliant green farm and pasture. In the Loess Hills, the geometry of June consisted of wildly curvacious crop rows on the hilly terrain. In southeastern South Dakota, it was the grass that mesmerized us. The roadside of our secondary-road route seemed to be planted with prairie grass and on this windy day it was wondrous to behold -- a hint of the vast sea of grass that was once the great plains... really like looking upon liquid green/gold. For most of our drive we kept ourselved entertained with reconnoitering. In the afternoon we turned on some Native American flute music to remind us we were passing through our first reservation. It got a little melancholy after a while, so we switched to the Roadhouse channel on SiriusXM -- a little torch and twang to enhance the western vibe. 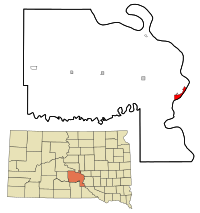 Location of Oacoma, South Dakota, on the Missouri River.